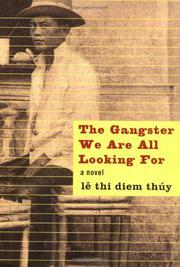 A detailed and moving saga of a Vietnamese family in America, subtly assembled from this limpid debut’s kaleidoscopic array of gorgeous and troubling word pictures. The unnamed narrator’s musings move forward and backward in time, from East to West, between her confused childhood and the “escape” she makes from her parents in California to relocate in the eastern US. The early pages describe her flight, with her father (Ba) and four uncles, from Vietnam by boat, their arrival in San Diego, and troubled relationships with a well-meaning American host family. After she and Ba have been reunited with her mother (Ma), the narrator then describes their constant moves from one apartment and job to another. We then learn about her parents’ youth, and Ma’s estrangement from her family for having married “a Buddhist gangster” who’s also her social inferior. As these details emerge, thúy builds a heart-wrenching picture of her narrator’s abstracted, conflicted psyche, repeatedly reemphasizing the girl’s preternatural sensitivity to new sights, sounds, smells, and textures while revealing the death of her older brother by drowning in childhood, and how this loss haunted her family for many years after. The consequent impressions of disorientation, resentment, and loneliness are powerfully conveyed by numerous abrupt, startling images (a girl killed by a napalm bombing that “made her body glow, like a lantern”; a dead butterfly preserved in a glass disk and employed as a paperweight; and a climactic vision of the bodies of small “silver fish” washed out of the open sea onto a moonlit beach). The narrative thus resembles a song with a pronounced central refrain, around which an infinite number of verse variations are clustered. Beautiful stuff—and a brilliant debut.